It is my pleasure to inform you that the hybrid GPU-CPU cluster is finally assembled and the first "burn-out" tests of the equipment are underway! Since the scheduling script is still to be designed, for now the cluster will be opened for logins on individual nodes that can access two GPUs, so that project collaborators can start playing around with the coding and code performance. 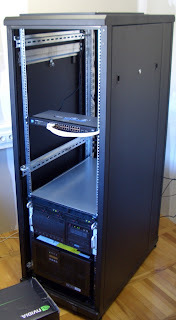 We were slowed down considerably due to various problems in purchasing the equipment and assembling the room for the cluster (power supply, acoustic isolation). The good news is that we have a dedicated room for our equipment and a dedicated classroom that will follow in the second part of the project by the end of the summer. 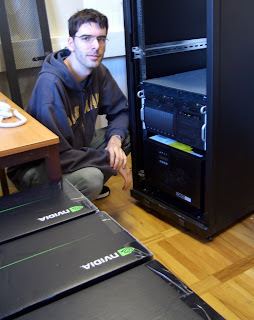 I have to mention that the cluster would not be assembled without the hard work of our two project assistants: Jurica Teklić and Dubravko Balić. Another very good news is that, after a long wait, the Ministry of Science and Education approved the novice position (PhD position) for one graduate student working on the Hybrid. As an effort to expand this project and get some money for additional personnel and travel support, we applied for a new research grant and now we are waiting for the results of the first round of evaluations. The important news regarding this application is that we have two companies involved as project partners and technical support to our project. One is VEUS d.o.o. from Zagreb and the other is Mirriad Limited from UK. The project partner is also the Department of Astronomy at the University of Washington as the host of our collaboration with the LSST project (http://www.lsst.org). This collaboration with LSST is especially interesting due to the scale and importance of the LSST project. 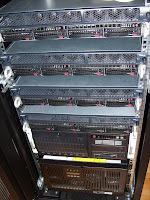 Yesterday, March 10th 2008, we successfully booted and provisionally set up the first two CPU nodes (2 quad core CPUs each) paired with one quad-GPU Tesla S1070 unit. Present at the happy event was the entire team (Dubravko, Jurica, Dejan & Mario -- see the photos), but the credit for setting everything up goes entirely to Jurica & Dubravko. Three other Tesla units are already at the site, while the remaining six nodes are expected to arrive later this week. 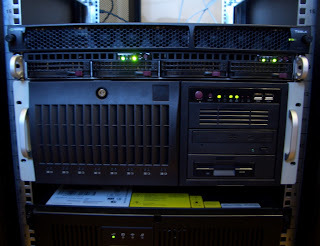 If everything goes according to plan, we should have the hardware portion of the cluster assembled next week. 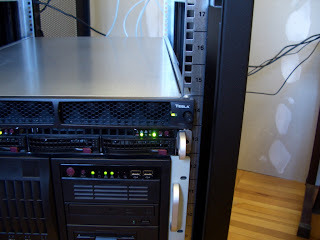 HYBRID's rack with the UPS, front-end node, two slave nodes, and a Tesla S1070. 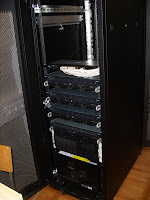 Very bottom to top: UPS, front-end node, two slave nodes in a single 1U case, and a Tesla S1070 (the top 1U case). Prof. Vinkovic (PI) with his graduate student Jurica Teklic. Co-I Mario Juric, visiting from the Institute for Advanced Study. 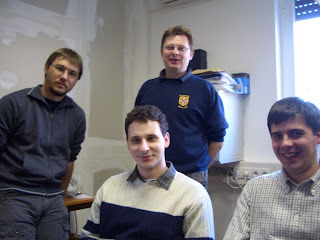 The local team (CW from center: Dejan Vinkovic, Jurica Teklic, Kresimir Cosic and Dubravko Balic).